Description: This poster is silkscreened in black, produced by Razia Selah for FEDSAW at the Screen Training Project (STP), Johannesburg. 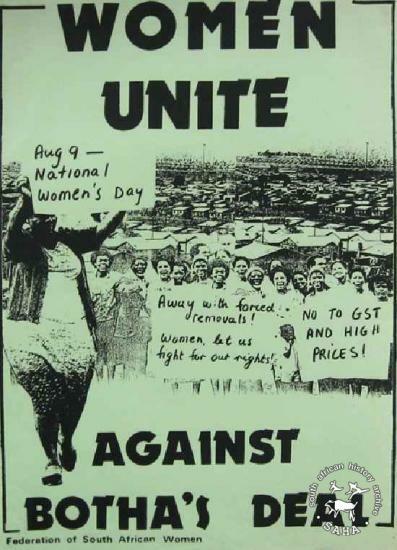 The poster depicts the women of South Africa and how they were encouraged to unite against the apartheid government's latest 'deal'. The text reads: "WOMEN UNITE : AGAINST BOTHA'S DEAL". Digitised by Specialised Archival Solutions in 2009. Reproduced in "Images of Defiance: South African Resistance posters in the 1980s" on page 35 (number 52) of the 1991 SAHA / Ravan Press edition and the 2004 SAHA / STE Publishers edition. It also appears on page 130 of “Red on Black: The Story of the South African Poster Movement”, SAHA / STE Publishers, 2007 and the SAHA Women Exhibition Kit .